Audrey Hepburn wasn’t wrong when she said, “Paris is always a good idea.” One of the cultural epicenters of the world, Paris has a reputation for high fashion, iconic landmarks, and mouthwatering cuisine. We’ve brought our guests to the “City of Light” for decades. 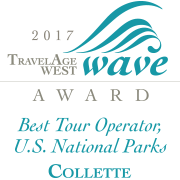 From a romantic dinner in the Eiffel Tower to a fascinating tour of Versailles, Collette’s tours truly bring the magic of Paris to life. From the artistic mecca that is the Louvre to the glistening waters of the River Seine, it’s easy to fill your travel itinerary with all the must-see landmarks in Paris. We know iconic locations like the Eiffel Tower are on your list. But with our expertise, we’ll guide you every step of the way – ensuring your Parisian adventures result in a vacation to remember. Separating the city into two distinct areas, the River Seine holds great cultural, commercial, and historic value to Paris. The river flows nearly 480mi from Dijon through Paris and into the English Channel. We love watching our travelers faces as they witness the city transform from day to night. Cruising along the banks of the River Seine, you’ll watch the setting sun descend on notable landmarks like the Notre Dame and Eiffel Tower. As the river is illuminated by moonlight, you’ll understand why Paris is for lovers. The largest museum in the world, the Louvre contains some of the greatest masterpieces of centuries past and present. Inside you’ll see many notable works ranging from Mona Lisa to the Great Sphinx of Tanis. But you don’t have to wander its halls alone. Let our knowledgeable guides assist you in finding works and collections that appeal to you. Whether you’re an art historian or merely curious about what’s inside this museum, we can help you make the most of this must-see Paris attraction. Situated between the Tuileries Garden and the Champs-Elysées, Place de La Concorde is one of the largest public squares in the French Capital. While visiting this area, our guides like to point out the Luxor Obelisk. This 75-foot high granite column was initially situated outside the Luxor Temple in Egypt over 3,000 years ago. In 1833, Egypt’s ruler, Muhammad Ali Pasha, gifted the obelisk to France as a token for helping to modernize the country. Stop here and contemplate this important part of French history. The Champs-Elysees is one of the most popular thoroughfares for Parisians and visitors alike. Located in the 8th arrondissement of Paris, the Champs-Elysees elicits images of posh retailers and iconic sites. Be sure to keep your eyes peeled as your guide points out the highlights found on this street including the Arc de Triomphe, Louis Vuitton flagship store, and Grand Palais museum. For a truly breathtaking view of the city, take the climb to the top of the Arc de Triomphe. You won’t regret it! Known since the 12th century as the political, economic, and religious capital of France, Paris has been host to some of the most important cultural events in the world. From the royal stomping grounds of Marie Antoinette to the many churches that served as a bastion of faith, these are just some of the historical sites that you’ll get a chance to visit on your tour. No trip to Paris would be complete without a visit to its most iconic landmark: the Eiffel Tower. Standing atop this stunning landmark, taking in miles of panorama views, is only the beginning. We take it one step further with a dinner at the Eiffel Tower, allowing you to admire the glimmering cityscape at night. A beacon of both literal and figurative light in the city, the Eiffel Tower is sure to leave you with a sense of awe. One of the most revered Catholic cathedrals in the world, Notre Dame is a powerful landmark in the heart of Paris. Touring this iconic cathedral for decades, we know how to make the most out of your visit here. Look up to admire the gilded ceilings and ornate stained-glass windows. Explore the cathedral treasury, a shrine that holds some of Catholicism's most important relics, including the Crown of Thorns, a fragment of the True Cross, and one of the Holy Nails. To visit a true representation of French history, your tour will head to the Arc de Triomphe. Constructed to completion in 1836, the building was commissioned by Napoleon to commemorate the soldiers who fought alongside this French dictator in the Napoleonic Wars. The power of this landmark remains eternal as engravings on the building list names of soldiers and depict battles fought. For a unique vantage point of the city, we suggest climbing the stairs to the top of this commanding structure – the memory is sure to stay with you. A palace representing opulence, royalty and revolution, Versailles was home to some of France’s most infamous kings and queens. Explore this enormous fortress with a local guide and hear the unique and vast history of Versailles. Afterwards, we suggest taking some time to explore the enchanting gardens. Even when not in full bloom, they are a sight to see! When pastry and wine are often cheaper than water and a salad, you know you’re in Paris. Culinary delights like macarons, foie gras and croissants have all been made famous thanks to our friends in this foodie city. From tiny cafes to five-star dining, our guides know the local spots that are perfect for any palate. Bon appetit! There’s nothing quite like walking along the Parisian streets as you nibble on a warm baguette. A gastronomical symbol of France, the baguette has been a yeasty staple food that’s been enjoyed for over 400 years. The city is so serious about their bread that each year, an annual award is given to determine the top bakeries that have Le Meilleur Baguette de Paris (the best baguette in Paris). Be sure to grab a loaf during one of your free afternoons in this city. In addition to great bakeries, fromageries (cheese shops) in Paris are second to none. With more than 300 varieties to choose from, it’s easy to be intimidated by the sheer volume alone. Luckily, our guides know what shops offer the best varieties. From funky and pungent to rich and creamy, you’ll be hard-pressed to find a selection you don’t like. In addition to the exquisite wines, Paris is also known for its champagne. Travel to Champagne country with your tour for great food, history, and a glass of this sparkling beverage! From the multitude of vines that climb along the hillsides, to the smell of freshly tilled soil, to the tickle of bubbles on your tongue, Champagne offers a veritable treat for the senses. While there, we suggest exploring ancient Reims, the site of nearly every coronation in France. In France, a square meal seems to always include fresh bread, a hunk of cheese, and a great bottle of wine. Trust your guide’s experience of the city and explore some of the city’s most notable brasseries for a glass of vin rouge (or blanc). Whether it’s paired with dinner, sipped outside a café, or enjoyed at a trendy speakeasy, Parisian wine is a delight for sommeliers and novices to the grape alike.